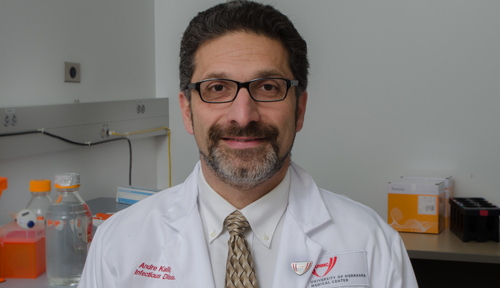 Meet UNMC Distinguished Scientist Andre Kalil, M.D. This profile is part of a series to highlight the 16 researchers who will be honored at a ceremony for UNMC's 2013 Scientist Laureate, Research Leadership, Distinguished Scientist and New Investigator Award recipients. My research is focused on improving the tools we doctors have to find out as soon as possible what is going on with our patients (faster and more precise diagnosis), so we can provide a more individualized treatment in a timely fashion. We are performing exciting research on new ways to better prevent serious infections in patients who have had organ transplantation. Also, we are working on the development of novel therapies for life-threatening infections such as sepsis and pneumonia. All my research is totally inspired by my patients. Every time I am at the bedside seeing a patient in the hospital or in the clinic, I am always thinking about two things. "What can I do right now to maximize the medical care of my patient and get this person better and able to return to her/his family and working activities?" and "What else could be done for this person that cannot be done with today's knowledge and tools?" The first question addresses the patient's current clinical needs, and the second question creates the basis for innovation and clinical research needs that will be essential for the treatment of future patients with the same medical problems. My late father, Felipe Kalil, said to me when I was ready to take the flight to move to the United States for my medical training: "Son, this is not a time to be sad or to look back . . . This is a time to celebrate and look forward to the marvelous life journey you have in front of you." I play the violin (not as well as my children), and enjoy listening to classical music, American jazz and Brazilian music. I am a marathoner and hope to keep running for my entire life. I am an unconditional fan of "Star Trek" (both the original series and the Next Generation). Live long and prosper, Dr. Kalil!